Rockleigh, NJ – October 30th, 2018 – Crestron, a global leader in classroom technology, is demonstrating its simple, scalable solutions for every space on campus at the EDUCAUSE® Annual Conference 2018. Guests to booth #1421 will see how Crestron’s active learning solutions transform classrooms into dynamic learning environments that are interactive, collaborative, and easy to use. Powerful Crestron software tools make configuration, deployment, and management simple, with no programming required. 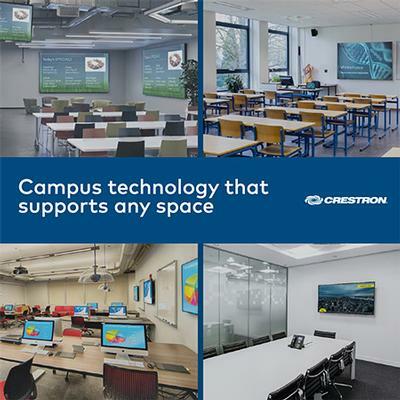 “Only Crestron offers the full range of solutions to deliver consistent student and instructor experiences in every space on campus, from the most basic classrooms to complex active learning spaces,” said Matthew Silverman, Manager, Education Technology at Crestron. DM NVX™ network AV technology, which enables schools to securely distribute the latest high-resolution video, up to 4K60 4:4:4 HDR, campus-wide over existing 1Gb infrastructure. The full suite of Crestron audio solutions including the new Saros® in-ceiling tile loudspeaker (ICT5T-12), designed to deliver high performance audio from multimedia presentations, video, and other sources in classrooms. The speaker is engineered for easy drop-in installation in 2'x2’ and 2'x4' ceiling grids. No-programming room solutions including AirMedia® 2.0 wireless presentation, MPC3 media presentation controllers, DigitalMedia™ all-in-one presentation systems, and Crestron Virtual Control, a server-based control platform that can replace multiple physical Crestron control systems. Crestron XiO Cloud™, the revolutionary IoT-based service that enables IT managers to securely deploy, proactively manage, monitor, and evolve Crestron educational technology campus-wide through a standard web browser, and reduce associated complexities. To learn more, please visit Crestron booth #1421 at EDUCAUSE Annual Conference 2018, Thursday, November 1st and Friday, November 2nd at the Colorado Convention Center, Denver, CO.